The presidency welcomed Wednesday the statement the European Union’s Council of Foreign Ministers issued on Monday and which stressed support for the freedom of the Palestinian people and their independence based on the two-state solution within the 1967 boundaries. Consul generals and representatives of Germany, France, Italy, Britain and Spain separately briefed Deputy Prime Minister for Economic Affairs Mohammad Mustafa at the presidential headquarters on the meeting of the EU foreign ministers and the statement issued afterwards which promised “an unprecedented package of European political, economic and security support” in the context of a final status agreement. The presidency welcomed as well the EU’s condemnation of Israeli settlement construction in the Palestinian Territory, describing it as an obstacle to peace. Senior Palestinian sources are blaming the Obama administration for favouring the Israeli positions in the peace talks. During U.S. Secretary of State John Kerry’s last two visits to the region and in his meetings with Palestinian Authority President Mahmoud Abbas, there were great disagreements and a difficult atmosphere prevailed in the discussions. Hareetz also reports that in addition to the security plan suggested by the Americans, which promised an Israeli presence in the Jordan Valley for 10 years, the issue of recognizing Israel as a Jewish state, as demanded by Prime Minister Benjamin Netanyahu, was also raised Haaretz reported. The London-based Al-Hayat newspaper reported that the United States had agreed to Israel’s demand regarding Palestinian recognition of Israel as a Jewish state, and that the Americans were putting pressure on the Palestinians to accept this position and include it in the framework agreement that Kerry plans to present in the next few weeks. In addition, the Palestinians resent the new preoccupation with keeping Israeli troops in the Jordan Valley, and claim that Israel is presenting that issue as separate from the core issues defined in the Oslo Accords, which include borders, refugees, settlements, security arrangements and water sources. The Palestinians argue that all negotiations conducted with Israel in the 20 years since Oslo was signed, the Jordan Valley was discussed in the context of security arrangements. But in the talks that began some four months ago, Israel started addressing this separately from the security issue. “Israel is doing all it can to lengthen the negotiations by bringing more and more clauses to the table, to cause a delay and to make the talks so cumbersome and complicated that they won’t produce any practical results,” a source told Haaretz. 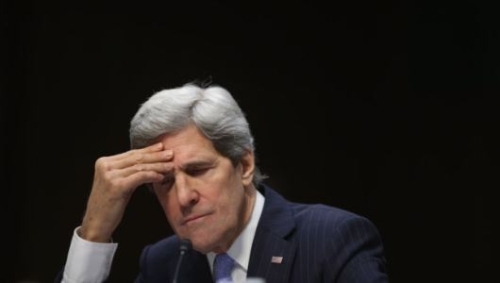 Palestinians no longer believe Kerry to be a neutral negotiator. The meeting that was held with him last Friday was described as being a very difficult one, one that left the Palestinians uncertain as to the future of the talks. It is said that Palestinian negotiators are preparing to seek support amongst the international community, because they no longer believe in the talks. The European Union has warned Tel Aviv against hurting talks with the Acting Palestinian Authority (PA) by announcing plans to construct new settler units on occupied Palestinian territories. The EU’s five largest states, Britain, Germany, France, Italy and Spain, warned on December 16 that Israel would be responsible for failed talks if it planned to announce further settlement construction after the release of Palestinian prisoners at the end of the month. However, if talks are positive, the foreign ministers of the 28 EU member states, based on a recently passed resolution, would award both Palestinians and Israelis with an “unprecedented package” of economic, political, and security aid. The ambassadors to Israel of the EU’s five largest states requested an immediate meeting with acting director-general of the Israeli Foreign Ministry Nissim Ben-Shitrit and are expected to hold similar talks with Palestinians. 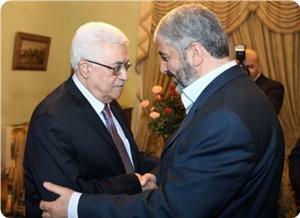 Palestinian and Israeli negotiators began a new round of talks in July. 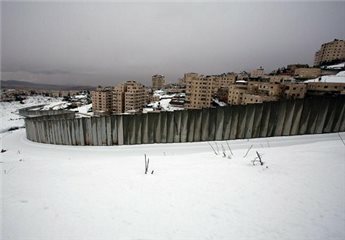 This comes while talks previously held between the Palestinians and Israel were halted in September 2010 after Tel Aviv refused to freeze its settlement activities in the occupied West Bank. Israel has so far defied international calls to stop its construction of illegal settlements. Despite ongoing talks with the Palestinians, Israel continues with building settlements on occupied territories. Over half a million Israelis live in more than 120 illegal settlements built since Israel’s occupation of the Palestinian territories of the West Bank and East al-Quds in 1967. The European Union on Monday pledged "unprecedented" levels of support to both Israel and the Palestinians should the two parties reach a final status agreement. Commending US Secretary of State John Kerry for his efforts in launching direct talks between the two, EU foreign ministers said the 28-nation bloc would "contribute substantially" to post-conflict arrangements to ensure the sustainability of a peace deal. "The EU will provide an unprecedented package of European political, economic and security support to both parties in the context of a final status agreement," the ministers said in a statement. "In the event of a final peace agreement the European Union will offer Israel and the future state of Palestine a Special Privileged Partnership including increased access to the European markets, closer cultural and scientific links, facilitation of trade and investments as well as promotion of business to business relations. "Enhanced political dialogue and security cooperation will also be offered to both states," the statement added. The US State Department welcomed the announcement saying it made the future for Israel and the Palestinians "even brighter." "Secretary Kerry has made clear how important it is for Israelis and Palestinians alike to envision the benefits that peace will bring," State Department deputy spokeswoman Marie Harf said in a statement. "The vision of increased access to European markets, closer cultural and scientific links, facilitation of trade and investments and business-to-business engagement will help strengthen and expand the economies of Israel and of a future Palestinian state." A senior EU official said it was too early to talk about numbers after Israeli daily Haaretz last week said the package would be worth "billions of euros" while also helping to end Israel's international isolation. Kerry said this weekend that concrete progress has been made in peace talks between Israelis and Palestinians, but said details will be kept under wraps. Calling on both sides to seize the chance to reach a two-state solution, the EU ministers also warned against "actions that undermine the negotiations," in particular deploring Israel's continuous expansion of settlements. Last month Israel agreed to join an EU scientific research project despite the fact it bars funding for any Israeli entity with operations beyond the 1967 Green Line. 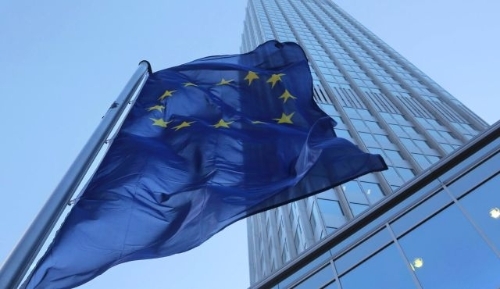 The European Union reiterated his willingness to make “unprecedented” deal in the fields of financial, political, economic and security support for Palestinians and Israelis when they reach a final peace agreement. 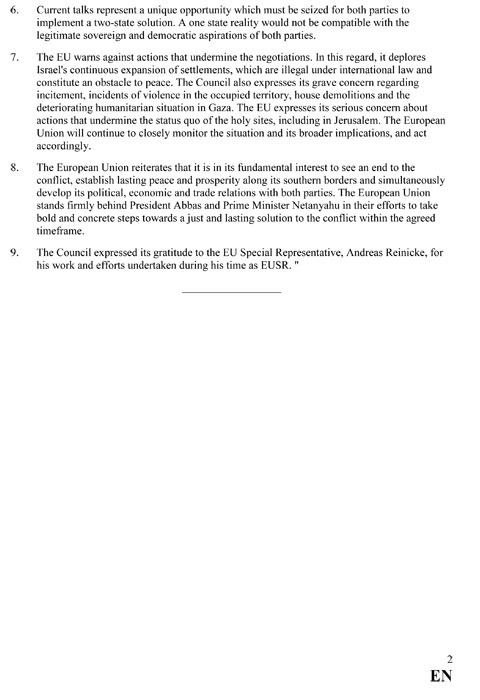 The hints of the EU came in order to make pressure and to urge the Palestinians to make further concessions with regard to their legitimate national rights in exchange for a package of “unprecedented” bribes to be provided by the European Union, whose is known for its questionable loyalties and unlimited allegiance to support israeli interests and for the so-called “peace process” plan carried by US secretary of state John Kerry. As a Palestinian, I assure the European Union that any Palestinian – Israeli agreement which dies not include at least a referendum about the returning right of the Palestinians will be a failure. It would be far better that the EU keeps the money of their taxpayers and the lofty promises of “unlimited support” and better use the money for the unlimited support for the masses of unemployed Europeans and to better the education in the EU countries, where an increasing number of Europeans live below the poverty line while their governments steal these tax moneys to provide political, economic and military briberies for the PA, which is at best an armed militia in Palestine and serves only the interests of the israel occupation regime by suppressing the will of the Palestinian people. 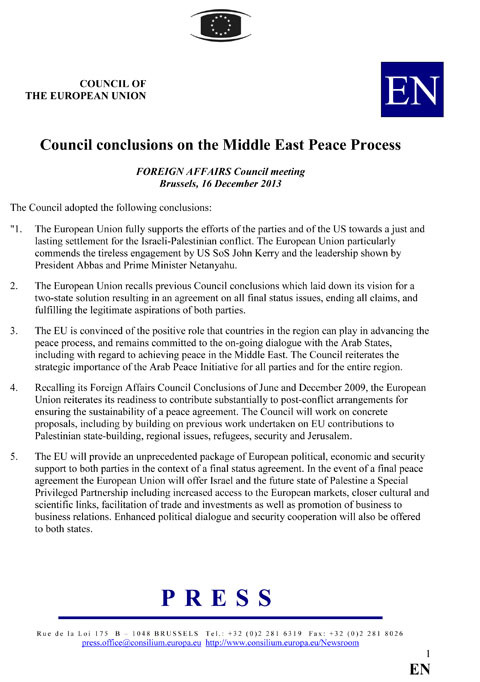 The EU said in a statement issued [PDF] on Monday, Dec. 16 2013 that EU foreign ministers meeting in Brussels today have adopted Conclusions on the Middle East Peace process, stating that the EU will provide an unprecedented package of European political, economic and security support to both parties in the context of a final status agreement. In the event of a final peace agreement the European Union will offer Israel and the future state of Palestine a Special Privileged Partnership including increased access to the European markets, closer cultural and scientific links, facilitation of trade and investments as well as promotion of business to business relations. Enhanced political dialogue and security cooperation will also be offered to both states. Current talks represent a unique opportunity which must be seized for both parties to implement a two-state solution. A one state reality would not be compatible with the legitimate sovereign and democratic aspirations of both parties. 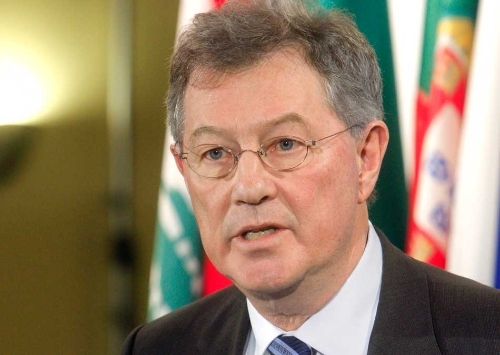 The EU warns against actions that undermine the negotiations. In this regard, it deplores Israel’s continuous expansion of settlements, which are illegal under international law and constitute an obstacle to peace. The Council also expresses its grave concern regarding incitement, incidents of violence in the occupied territory, house demolitions and the deteriorating humanitarian situation in Gaza. The EU expresses its serious concern about actions that undermine the status quo of the holy sites, including in Jerusalem. The European Union will continue to closely monitor the situation and its broader implications, and act accordingly. The European Union reiterates that it is in its fundamental interest to see an end to the conflict, establish lasting peace and prosperity along its southern borders and simultaneously develop its political, economic and trade relations with both parties. The European Union stands firmly behind President Abbas and Prime Minister Netanyahu in their efforts to take bold and concrete steps towards a just and lasting solution to the conflict within the agreed time-frame. The Council warned against actions that undermine the negotiations and deplored Israel’s continuous expansion of settlements, which it described as “illegal under international law and constitute an obstacle to peace”. The Council also expressed its grave concern regarding incitement, incidents of violence in the occupied territory, house demolitions and the deteriorating humanitarian situation in Gaza, and actions that undermine the status quo of the holy sites, including in Jerusalem. US Secretary of State John Kerry insisted, on Sunday, that concrete progress has been made in peace talks between Israelis and Palestinians, but that the details are to be kept under wraps, the Ma'an News Agency has reported. Kerry has made nine trips to the Middle East, since March, helping launch nine-month direct talks between the two sides, in July. He says that talking about any agreements could be counterproductive. "I'm personally encouraged that very tough issues are beginning to take shape," he said in an interview with ABC's "This Week." "But we've agreed not to be talking about what we're doing because it just creates great expectations. It creates pressure. It creates opposition, in some cases. "I think it's much better for us to do exactly what we've been doing, which is negotiate quietly and privately," he continued. Israeli and Arab media reports say that the plan envisaged by Washington would see Israel maintain a military presence on the border after a peace agreement with the Palestinians. An international force would be acceptable to the Palestinians, but Israel opposes such a solution. Israel has always insisted that a continued border presence would be vital to its security for some 10-15 years after Palestinian statehood. 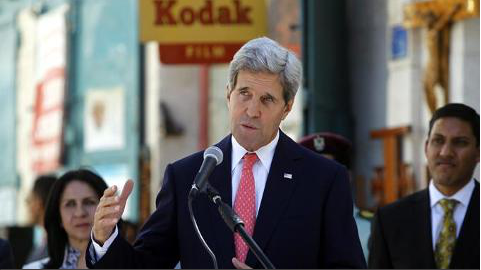 Kerry said, before his latest trip to the region, "we are closer than we have been in years" to reaching a deal. State Department spokeswoman Jen Psaki had said that the United States was "focused on a final deal" rather than an interim agreement. Kerry expressed optimism, Sunday, that this was "a different moment" for the conflict which could allow "a different set of choices" than in past failed efforts. US Secretary of State John Kerry insisted Sunday concrete progress has been made in peace talks between Israelis and Palestinians, but said details will be kept under wraps. Kerry, who has made nine trips to the Middle East since March and helped launch nine-month direct talks between the two sides in July, said talking about any agreements could be counterproductive. Israeli and Arab media reports say the plan envisaged by Washington would see Israel maintain a military presence on the border after a peace agreement with the Palestinians. Before Kerry's latest trip to the region, he had said "we are closer than we have been in years" to reaching a deal. And State Department spokeswoman Jen Psaki had said the United States was "focused on a final deal" rather than an interim agreement. On Sunday, Kerry expressed optimism that this was "a different moment" for the conflict that could allow "a different set of choices" than in past, failed efforts. "I think that the dynamics of the Middle East offer a different moment, the possibilities of peace with the Arab League, the realities of what might and might not stare people in the face if you don't get an agreement," he said. "And hopefully, the leaders will seize this moment and at least move the ball forward somewhat." But he cautioned that the conflict has "confounded presidents and secretaries of state for 30 or 40 years." Hamas movement affirmed its adherence to resistance as the only strategic choice to liberate Palestine, defeat the occupation and achieve the right of return for the Palestinian refugees. The movement said in a statement, commemorating its 26th inception anniversary on Saturday, it will never give up the national constants and rights. It denounced the futile PA-Israeli negotiations and stressed its adherence to the resistance as the only way to protect the people, Jerusalem, Al-Aqsa Mosque and the national constants, despite all the obstacles and conspiracies. Hamas underlined that the protection of Jerusalem and the Islamic and Christian holy sites is a national and Arab duty, and that it will confront all the Israeli occupation attempts to Judaize the holy places and Jerusalem and displace its residents. It also called on Fatah movement to implement the terms of the national reconciliation and to work on restructuring the Palestine Liberation Organization (PLO) according to a unified strategy based on the resistance and the adherence to the rights and national constants. It demanded the current leadership of the PLO to halt the futile negotiations with the occupation, and reject the U.S. pressure that aim to liquidate the Palestinian cause. 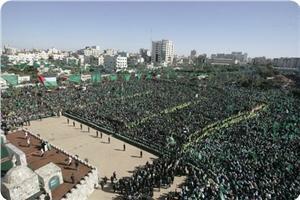 The movement also urged the Arab League to end the unjust blockade imposed on the Gaza Strip. US Secretary of State John Kerry arrived on his second Middle East trip in less than a week Thursday in yet another bid to promote a so far elusive Israeli-Palestinian peace deal. He went straight to Ramallah in the occupied West Bank for a meeting with Palestinian Authority President Mahmud Abbas, slightly later than scheduled because of a winter storm sweeping the region. 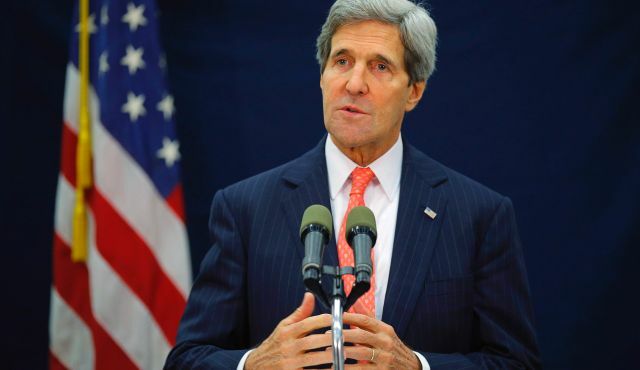 On Friday, Kerry is to meet Israeli occupation prime minister and president before continuing on to Jordan. US State Department spokeswoman Jen Psaki said earlier this week Washington's aim was "focused on a final deal" rather than an interim agreement between Israel and the Palestinians. Nine-month direct talks were launched between the sides by Kerry in July, and last week he said "we are closer than we have been in years" to reaching a deal. 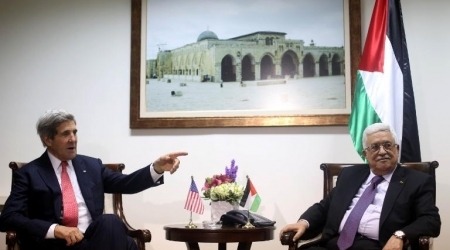 However, the Palestinian Authority said Kerry's ideas on future security arrangements, which were presented to the Palestinian leadership last week, had provoked a "real crisis". 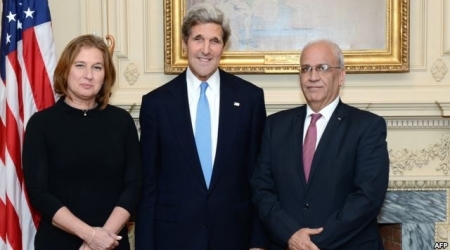 On Monday, Kerry met Israeli chief negotiator Tzipi Livni and her Palestinian counterpart Saeb Erakat in Washington for three-hour trilateral talks. But on Thursday, Livni accused a key Israeli coalition partner of deliberately seeking to sabotage the talks by ramping up settlement construction. Speaking just hours before Kerry's arrival, Livni accused the far-right national religious Jewish Home of deliberately promoting settlement projects in a bid "to derail" the negotiations. "More building, more announcements of building in isolated settlements are meant to prevent us reaching peace," she told an audience at a university in remarks broadcast on public radio. "That is their deliberate intention, to derail the negotiations. To cause the other side to walk out of the room," she said. enhance the US commitment to Israel’s “qualitative military edge” in the region, the JTA news agency reported. The Israeli regime is carrying out large-scale Nazi-style ethnic cleansing in the occupied West Bank by destroying the Palestinian properties, an analyst tells Press TV. “In my opinion, this type of large-scale ethnic cleansing is nothing more than what I would call...Israeli style and I think that in its inhumanity and in its callous displacement of indigenous population, I would call it Nazi-like in its extreme disregard for human life for the rule of law,” Bruce Katz said on Friday. Palestinian homes and displacement of their residents in the West Bank. Katz said the Israeli actions are stalling the move towards peace in the Middle East. “I think that there can be no advancement toward any peace process in the Middle East unless there is a regime change in Israel,” he added. Rights groups say Tel Aviv’s demolitions are aimed at grabbing more land for construction of illegal settlements and launching military projects in the occupied Palestinian territories. 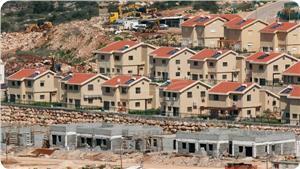 The Israeli regime has recently announced plans to build about 5,000 more illegal settlement units on the occupied Palestinian land. U.S. Secretary of State says nine-month timeframe to achieve final agreement is still on; emphasizes that goal is final agreement, not interim deal. U.S. Secretary of State John Kerry said Friday that the third group of Palestinian prisoners will be released as planned on December 29. Speaking at a press conference at the U.S. Embassy in Tel Aviv before departing to Vietnam, Kerry said the U.S. is "not talking at this point about any shifts (in the schedule)." Over the last week, Kerry attempted to convince the Palestinians to agree to delay the prisoner release by a month, fearing that Prime Minister Benjamin Netanyahu, after the planned release, would declare another wave of settlement construction which could derail the peace process. Kerry had offered the Palestinians that the fourth group of prisoners will be released sooner so more than 60 Palestinian prisoners will be released at the end of January at once. Kerry had wanted the prisoner release to take place at the same time as the presentation of the "framework agreement" which he plans to formulate with both sides in the coming weeks. The Palestinians rejected Kerry's offer and claimed it was a violation of the agreements that were reached in order to restart the peace talks. The Palestinians stressed that if the prisoner release would not take place on the date planned they would see themselves as free to pursue unilateral moves in the United Nations. Kerry's press conference came after a three-hour meeting with Palestinian President Mahmoud Abbas in Ramallah on Thursday night and another meeting with Netanyahu in Jerusalem on Friday morning. 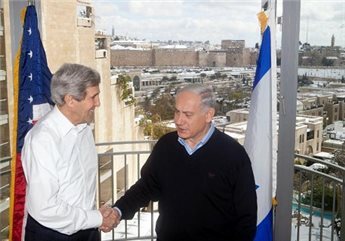 Kerry's visit in Jerusalem and Ramallah proved to be a difficult operation due to the heavy snowstorms in the area. 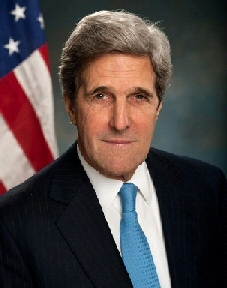 In the press conference, Kerry emphasized that there is no plan to extend the nine-month timeframe that has been given to renewed peace talks. "Our goal remains a final status agreement. Not an interim agreement," he said. Kerry praised Netanyahu and Abbas on their serious intentions regarding the peace talks and said a final agreement "will make Israelis and Palestinians more secure and prosperous." President Mahmoud Abbas has rejected US proposals for Israel to keep troops in a future Palestinian state along its border with Jordan, a Palestinian source said on Friday. Following a meeting on Thursday evening with US Secretary of State John Kerry in the West Bank city of Ramallah, "President Abbas has rejected the ideas presented by the secretary of state", the source said. Abbas also gave Kerry a letter on "Palestinian red lines," the source added, singling out "the refusal to recognize Israel as a Jewish state." Abbas "rejected the ideas on security because there is not a third party." This refers to a plan by former US national security adviser James Jones under which a third party would deploy along the Palestinian-Jordanian border. The Palestinian source said that "all disputed issues must be settled." Abbas' comments were made public as Kerry met Israeli Prime Minister Benjamin Netanyahu in Jerusalem in his latest attempt at promoting an elusive Israeli-Palestinian peace deal. In early December, Israel's deputy defense minister ruled out any compromise on security in the Jordan Valley. "From the Israeli point of view, there will not be any Palestinian presence at the crossing points," said Danny Danon, who is a radical member of Netanyahu's rightwing Likud party. "An Israeli civilian and military presence in the Jordan Valley is essential." Over 94 percent of the Jordan Valley and the Dead Sea area is prohibited for Palestinian use, with the land either declared a closed military zone or reserved for illegal Israeli settlements. The Jordan Valley forms over 30 percent of the occupied West Bank. The Israeli Defense Ministry’s Civil Administration rejected Tuesday a Palestinian request to legalize a West Bank house under the pretext the structure was too close to a main road. On Monday, however, the same administration had approved the expansion of the illegal settlement Ofra after revoking the same ban that was then upheld in Tuesday’s decision, the Haaretz reported. On Tuesday, the request for a retroactive building permit, which would have canceled a demolition order the house is currently facing, was denied to Palestinians in Beit Ummar, northwest of Hebron, due to a regulation that houses must be more than 120 meters away from Route 60. Due to the rejection the house may now be demolished at any time. However, one day previously, the same administration reduced the permitted distance to 80 meters from the road in order to accommodate the construction of 50 new illegal Israeli homes in the settlement of Ofra. When Tuesday’s appeal came, the administration upheld the 120 meter requirement. Haaretz concluded noting that the administration declined to comment. 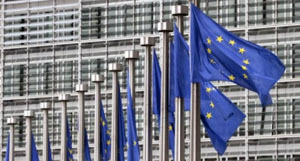 The European Union (EU) is expected to announce Monday an unprecedented assistance package offer to Israeli and Palestinian authorities if the parties reach a final-status agreement, according to Israeli daily Haaretz. The draft proposal states that after their arrival at a solution, the status of both Israel and the future Palestinian state will be raised to “Special Privileged Partnership” with the EU, said Haaretz. 1. Increased access to the EU market. 2. Closer cultural and scientific ties to the EU. 3. Facilitation of trade and investment. 4. Promotion of business-to-business relations. 5. Enhanced political dialogue with both states. 6. Enhanced security cooperation with both states. 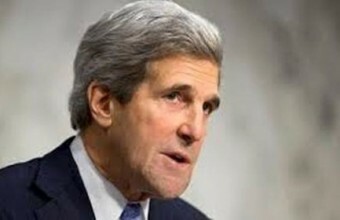 US Secretary of State John Kerry met on Friday, with Israeli Prime Minister Benjamin Netanyahu in Jerusalem. Israel's Army Minister Moshe Ya'alon joined the meeting. Israeli diplomatic sources said that they did not expect any progress in the Netanyahu-Kerry talks and that an extension to the nine-month deadline to negotiations would likely be necessary. The sources added that Israel is waiting for a response from the Palestinians on three key issues, namely the recognition of Israel as the Jewish state, a commitment to end all claims and the controversial Palestinian refugee matter, The Times of Israel reported. Kerry met Palestinian President Mahmoud Abbas in Ramallah Thursday evening. During the meeting, Abbas confirmed that if Israel insists on maintaining security presence in the Jordan Valley, there will not be a peace agreement. Abbas said that all the Israeli "settlements" are located on "Palestinian land" and must be evicted. He added that the Palestinian Authority (PA) would agree to extend the current talks by one month, if serious progress is made for the talks. US Secretary of State John Kerry was to meet Friday morning in Jerusalem with Israeli Prime Minister Benjamin Netanyahu, in his latest attempt at promoting elusive Israeli-Palestinians peace talks. The two were to meet in a city-center hotel at 6:30 GMT, after the US envoy held more than two hours of talks Thursday evening with Palestinian president Mahmud Abbas, in the West Bank city of Ramallah. No details were released on the content of the Kerry-Abbas meeting, which took place immediately after Kerry's arrival in the region. It is his ninth trip to Israel and the West Bank since March, and his second in less than a week. State Department spokeswoman Jen Psaki said earlier this week the US was "focused on a final deal" rather than an interim agreement between Israel and the Palestinians. Nine-month direct talks were launched between the sides by Kerry in July. Last week, he said "we are closer than we have been in years" to reaching a peace deal. But Palestinians said Kerry's ideas on future security arrangements, which were presented to the Palestinian leadership last week, had provoked a "real crisis". Kerry's December 11-18 trip will also take him on to Vietnam, where he fought as a naval lieutenant in the Vietnam War, and the Philippines. 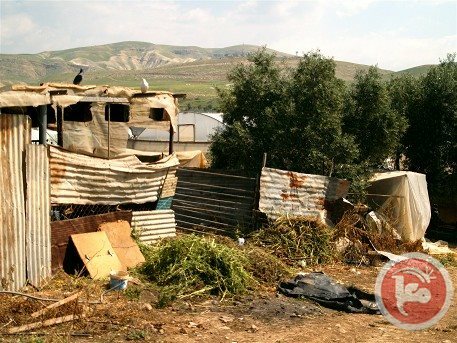 The Israeli army's civil administration recently approved construction plans for Jewish settlers in an area close to Ofra settlement in the West Bank and prevented a Palestinian family from living on their own land in the same area, the Israeli newspaper Haaretz stated on Thursday. "The civil administration on Tuesday rejected a request to legalize a Palestinian house, claiming it was too close to a main West Bank road. A day earlier, it approved the construction of homes in the West Bank settlement of Ofra, after revoking the very ban on which the Tuesday decision was based," Haaretz stated. According to the newspaper, human rights groups believes that the administration's planning is politically motivated and aimed at pushing the Palestinians off their land. 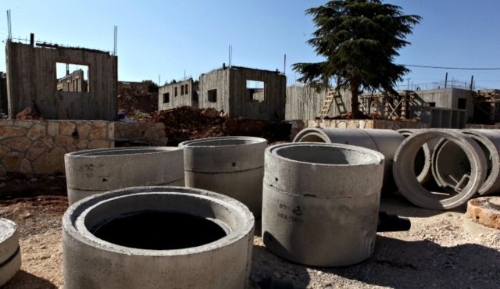 The request that a retroactive building permit be issued for the Palestinian house in Beit Ummar, a village 11 kilometers northwest of Al-Khalil city, was rejected on Tuesday by the administration’s planning and licensing committee, headed by architect Daniel Halimi. The administration had previously issued a demolition order for the Palestinian house, which was denied a construction permit. Halimi, wrote in his decision that regulations forbids the building of houses less than 120 meters away from Route 60, as it both obstructs the traffic and disturbs the people living near the road. "The rejection made it possible to demolish the house," he said. 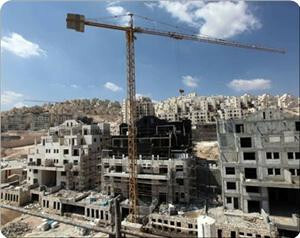 However, on Monday the administration decided exactly the opposite regarding homes belonging to Jewish settlers. "The Israeli administration is in the process of legalizing some of Ofra's illegal construction, in terms of a new master plan it has drawn up for the settlement. Ofra was built without a master plan, as required, and most of its houses were built without permits on private Palestinian land," the newspaper emphasized. The new plan is aimed at legitimizing some 200 illegal houses and authorizing the construction of some 50 new homes for Jewish settlers. However, these houses in question are less than 120 meters from Route 60.